Support for SPD, in coalition talks with CDU/CSU to form a German government, is now at a record low. Doubts mount. 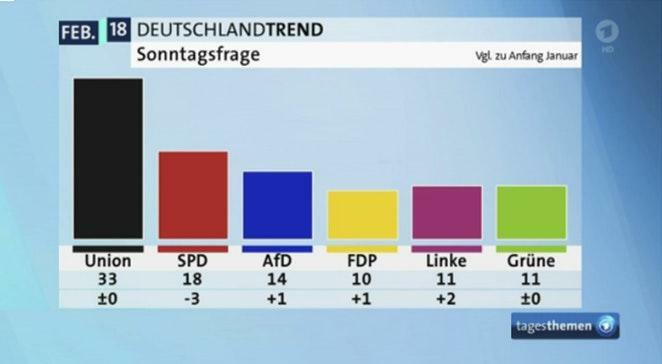 The poll results are from the Tagesschau.De article SPD Trend Slips to 18 Percent. The article is in German. As is typically the case with Google translations from German, the results need quite a bit of working over. I cannot read or write German but it is usually easy to spot errors. 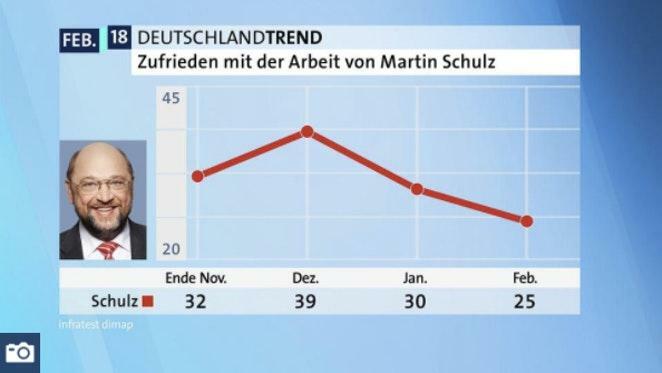 I like this amusing as-translated subtitle regarding SPD party leader Martin Schulz: "Schulz rated as bad as never". Only 25 percent of citizens are satisfied with his work, five points less than last month, a record low. That Germany has no new government more than four months after the election is barely comprehensible to the Germans: 71 percent do not understand why it takes so long to form a government. The above paragraph is my translation. As translated by Google "71 percent have no understanding that the formation of a government takes so long." It's usually easy to make such corrections but sometimes I am scratching my head. Typically, I ignore offending paragraphs. Let's now turn our attention to comments from Eurointelligence regarding the poll. There can be no doubt whatsoever that CDU/CSU and SPD will conclude a coalition agreement. The doubt is only about whether SPD members will accept it. The reason why the SPD leadership is now becoming desperate to strike a deal is the latest polls. The CDU/CSU is stable at 33%, but the combined share of the two largest parties would only be 51%. With this poll we are now within the margin of error of a result in which a grand coalition becomes no longer arithmetically possible. This has already happened in the Netherlands, and we think it will happen in Italy on March 4, too. In this case, the smaller parties will become disproportionately powerful. The AfD has 14% and is only 4 points behind the SPD. That gap, too, is within the margin of error of the polls. The other three parties are all scoring 10-11%. With this poll, even a Jamaica coalition would only have the thinnest of majorities. While it makes sense for the SPD leadership to support a grand coalition out of pure self-interest, SPD members have different incentives. They couldn't care less whether MPs who narrowly managed to get a seat at the last election will have to fight for their seat again and possibly lose it. Or that Martin Schulz and Sigmar Gabriel may have to look for another job. All we know is that the SPD grassroots activists are massively opposed to a grand coalition and that SPD voters are split - we've seen polls of 50/50 and 60/40. But the voters are not necessarily representative of the members, nor are the activists. The outcome of the party referendum is genuinely uncertain, and we believe that the financial markets, in particular, are underestimating the possibility of a rejection. Eurointelligence notes that Merkel and SPD now agree on "almost everything". This buddy system offends the SPD rank and file. It also offends CDU/CSU party members accusing Merkel of giving in. For example, Angela Merkel made a big concession to Schulz by accepting the principle that the ESM is to be brought under EU law. But this is under attack by components of CDU/CSU as well as FDP and AfD. Merkel upset the Greens and SPD rank and file by backing off diesel emissions. She and Schulz also upset SPD rank and file when they agreed via sleight of mouth to both cut and expand immigration. As I pointed out before this coalition agreement is about nothing more than keeping both Merkel and Schulz in power. The latter wants to hang on to his political perks like free limousines for as long as he can. "Don't celebrate yet. Once a final deal is reached, assuming a deal is reached, the party’s 450,000 members have an up or down vote on the package. With only 56% of the party leaders in favor of the deal, the membership vote is certainly questionable." Ratification is at best 50-50. New elections are the most likely result if the rank-and-file vote this mess down. A grand coalition that lasts for a year or so, with AfD gaining parliamentary powers. The grand coalition then splinters with infighting and another election in which Merkel steps down and SPD is trounced.